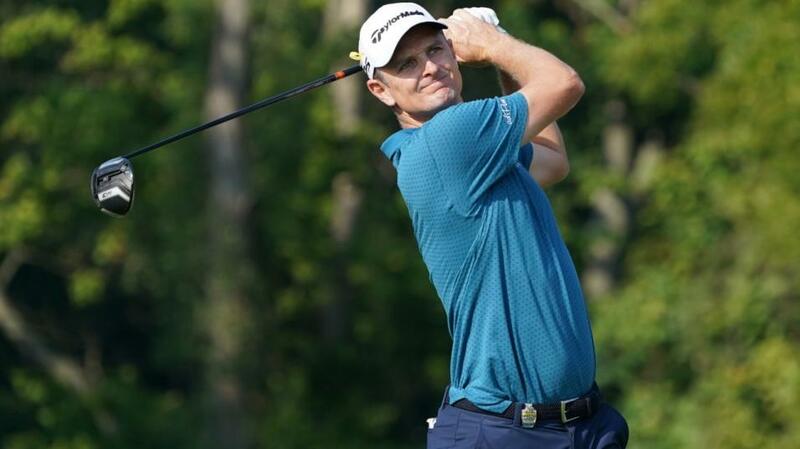 Justin Rose leads the BMW Championship with a round to go but after a whole day is lost to the weather, will we get another round in or is he already the winner? The rain was unrelenting in Newton Square yesterday and not a single stroke was struck at Aronimink. Tee-times have again been moved forward and an attempt will be made to get the fourth and final round of the BMW Championship played today. Should they start on time, the leaders are due out at 14:20 UK time and here's the leaderboard with prices this morning. You'll notice that Justin Rose has shortened up since yesterday as at least some backers presumably think they'll get paid out should the event be reduced to 54 holes but as the rules state "If a tournament is shortened and Betfair settles the tournament markets then all bets matched after the last completed round will be void" no trades made after the close of play on Saturday are going to stand. I thought we had a fair chance of getting done today when I looked at the forecast last night but looking again this morning I'm not so sure now. The course is absolutely sodden, so they'll need a bit of a break first thing to get it playable again and I'm not convinced they'll get it. Betfair has opened an Exchange market on whether 54 or 72 holes will be played and the latter is the outsider. I've layed Rose and McIlroy at [3.0] and [4.3] but I suspect both trades will end up just getting cancelled when they declare play impossible and a 54-hole result. If they do go to 72 holes today, Rose has the added pressure of getting to world number one with a win and I'm just not convinced by Rory at the moment. He's quite inconsistent, especially with the putter, and there are some great players lurking. In an attempt to get a conclusion to the BMW Championship today, the fourth round tee times were moved forward at Aronimink but play hasn't even started and we've got a weather delay. And looking at this forecast, if it's rain to stop that they're waiting for, they could easily be waiting all day! Anyway, whether they play today or tomorrow, here's the leaderboard with prices to back at 13:00. This doesn't look straightforward at all. If they get going at all today they're going to have to play in some foul conditions and with so many class-acts lurking it's really tough to call. Xander Schauffele had to scramble well yesterday but could easily play better in round four. After rounds two and three, Tommy Fleetwood became just the fourth player in the last 30 years to post consecutive rounds of 62 or lower in the same PGA Tour event, so he's clearly in the groove. Rickie Fowler is a fabulous foul weather player who's a better chaser than frontrunner and the likes of Justin Thomas, Hideki Matsuyama and Francesco Molinari are all more than capable of going super low. If they do play in nasty conditions, whether it's today or tomorrow, I'm tempted to lay Justin Rose and Rory McIlroy and sit back and see what happens. I'm never convinced by Rose and as I highlighted yesterday, when I back him he seems to perform poorly and get beat, but it's undeniable that he has a 50% strike-rate when leading with a round to go so I know that my perception could easily be skewed. Rory looks easier to oppose as I'm convinced he's a better player in easier conditions than they're likely to encounter...if they play. And that's the issue, when will they play? And will they even play today? So I'm going to give it some more thought, keep an eye on the weather, and see if I get a positive result in Switzerland, where the fourth and final round is well under way. And talking of the Omega European Masters, which is currently live on Sky, my pre-event pick, and Paul krishnamurty's each-way fancy, Lucas Bjerregaard, has started round four well to hit the front and I've layed some of my wager back at [2.68]. Defending champion, Matthew Fitzpatrick, hasn't bogeyed a hole since the fourth on Friday and after a sensational seven-under-par 63 in round three, he's sauntered to a two-stroke lead. Here are the latest standings with prices to back at 18:10. Fitzpatrick won from four shots back with a round to go 12 months ago, thanks in part to third round leader, Scott Hend, stumbling and we've seen a couple of players win from four adrift in the last 20 years - Sven Struver in 1998 and Jean-Francois Lucquin ten years ago - but on both occasions they too received help from the leaders. Both had begun the final day in second place and they both benefited from the 54-hole leaders failing to break par. Patrick Sjoland shot a level-par 71 20 years ago and Rory McIlroy shot 71 in 2008. If we look a bit further back, Costantino Rocca won from five adrift in 1997 and Jamie Spence shot 60 to win from an incredible ten back in 1992 but I've gone back as far as 1985 and every other winner has been within three of the lead with a round to go. If Fitzpatrick keeps his cool, he's going to be extremely hard to pass. Mike Lorenzo-Vera is the only man within four of the leader and he's obviously the biggest threat but he's 33 now and playing in his 167th European Tour event without success. He's impossible not to cheer for after his emotional interview following his playoff defeat to Joakim Lagergren in Sicily in May and he didn't do an awful lot wrong that day but he might just want it too much tomorrow. Having backed Fitzpatrick before the off (far too modestly!) and with pre-event pick, Lucas Bjerregaard in-the-mix, as well as halfway play, Haydn Porteous, I backed Lorenzo-Vera after he'd finished his round at [6.0]. That looked a decent price so I thought it wise to cover him but it didn't look quite so good after Fitzpatrick did this on 18 to extend his lead to two. Of the others chasing Fitzpatrick, young American, Doug Ghim, who only turned pro in June having reached number one in the amateur ranks, is an interesting contender with his dad on the bag but this is definitely Fitzpatrick's to lose. The Sheffield star is aiming to be the first to win back-to-back since Seve 40 years ago and he's a perfectly fair price to do so. The BMW Championship has been delayed due to poor weather and looking at the forecast, further interruptions look inevitable, but round three is off and running and live on Sky and I'll be back tomorrow with another look at that event. While doing a shift in the comms box on Sky yesterday afternoon, Nicolas Colsaerts said he felt it was a little unfair to put the three players that had narrowly missed out on Ryder Cup qualification together for the first two days at the Omega European Masters and it certainly seemed to get to his fellow countryman, Thomas Pieters, if this is anything to go by! My in-play pick, Matt Wallace, one of three playing in the group dubbed 'The Rejects' by Pieters, looked a bit tired as he scrambled his way to a one-under-par 69 in the afternoon but the third member, defending champion, Matthew Fitzpatrick, recovered brilliantly after a slow start and having been matched at a high of [46.0] he's now the firm favourite. Here's the current leaderboard with prices to back at 09:00. Those drawn afternoon-morning over the first two rounds shot an average of 1.52 strokes more than those drawn AM-PM so Hideto Tanihara has performed very well to take a two-stroke 36-hole lead from the wrong side of the draw. Halfway leaders have a decent record here. Since 1996, 16 men have held a clear lead and six of them went on to convert making Tanihara's odds look generous at first glance. The pre-event [360.0] chance is vastly experienced and he's won 14 times but he's never won outside of his native Japan and at 39, this could well be his last legitimate chance to do so. Tanihara has held a clear lead at this stage four times in Japan but only once did he convert and he led the WGC-Bridgestone Invitational by a couple of strokes two years ago before eventually finishing tenth. I can see him faring far better than that here but he's fairly priced and no more. After a solid seventh in Denmark last week and with course form figures reading MC-2-7-1, defending champ, Matthew Fitzpatrick, looked the man to beat before the off and he's definitely the most likely winner now. He hasn't won since last year's victory, his fourth on the European Tour, but he's utterly reliable in-contention and after recovering from a relatively slow start he can go on to become the first to defend since Seve in the seventies. Another of my pre-event picks, and Paul Krishnamurty's fancy for the red-hot each-way column, Lucas Bjerregaard, is alongside Fitzpatrick and playing in the penultimate two-ball and there are plenty of other dangers lurking. Mike Norman's each-way fancy and the 2015 winner, Danny Willett, is the main danger to my pair but the one I like at a decent price at this stage is the man Willett plays with today - Haydn Porteous. He's extremely inconsistent and he misses lots and lots of cuts but he's won twice on the European Tour in the last three years so he knows how to get the job done when he gets a chance so I thought [38.0] looked decent given he's only three off the lead with only four men ahead of him. Fitzpatrick won from five back at this stage last year so with 15 players within four of the lead, this is still wide open on paper but in the previous 20 years, Richie Ramsay, who'd trailed by four in 2012, had been the only winner not to be within three shots of the lead at this stage so concentrating on the leaders may well be the way to go. With eight players trading at 20/1 or less, this championship is wide open. We witnessed much change yesterday and we could well do again today. Justin Rose was in front by this stage when he won the 2010 AT&T National but 12 months later, on the last occasion a PGA Tour event was staged at Aronimink, Nick Watney sat outside the top-20 at halfway, trailing by six, before going on to win. Current leader, Xander Schauffele, won twice on the PGA Tour last year, including the season-ending Tour Championship at East Lake, but both victories came from off the pace. He did very little wrong at the Open Championship in July however, when he finished runner-up to Francesco Molinari, having been tied for the lead through three rounds and he looks a dependable type in-contention but this is just a very open looking heat. Rose and I have a longstanding understanding. If he looks to have a very obvious chance to win and I back him he loses, and if I don't he invariably wins. This could easily be his week. It's really quite remarkable and it's been going on for years but it's just a reflection of what you get with Justin. He's a solid and dependable player in-the-mix but he is a bit unpredictable and he's more than capable of throwing in a poor effort in-contention now and again. Yesterday morning was the time to back him and I'm kicking myself for not doing so really. He very often starts tournaments slowly before getting involved as it progresses and he's the worthy favourite now. Having thrown a few darts yesterday, I'm going to leave this event alone for now and see what today brings but I've got a nasty feeling that Rose and I's relationship is going to blossom further. The Englishman looks poised for another Aronimink success. Wide, soft fairways were meat and drink to Tiger Woods and Rory McIlroy at Aronimink yesterday. Woods opened up the BMW Championship by posting 29 on the back-nine (his first nine) and McIlroy birdied six in-a-row form the ninth and both men ended the day on eight-under-par after shooting 62s that could have been better. Woods played his last eight holes in only one-under and McIlroy bogeyed both 16 and 17. With the threat of poor weather later today, the second round has already started but here's the first round leaderboard with prices to back this morning at 11:00. Tiger's 62 was his best opening round since he fired 61 at the Byron Nelson Classic back in 1999 and it's the first time he's led or been tied for the lead after round one since March 2013. Incredibly, this is also the first time that Rory's ended round one in front since the DP World Tour Championship almost four years ago, so as experienced as they both are, they're in front for the first time in a very long time. The two, understandably, dominate the market but I'm happy to look elsewhere. Woods is looking for his first success in more than five years and McIlroy isn't the greatest of frontrunners. He won the Open Championship wire-to-wire in 2014 but since he took this title six years ago, he's led or co-led after round one nine times and that win at Royal Liverpool was the only occasion he went on to win. I'm not writing either man off, that would be ridiculous, but I do think they're prominence in the market has created a bit of value elsewhere. Last year's Tour Championship winner, Xander Schauffele, looked over-pried given he trails by only one after the first round and I also like another East Lake winner, Billy Horschel, and Justin Thomas, who was second to Xander last year. Please accept my apologies for not getting this post up earlier but I've had a leaking radiator that couldn't be left so this is three hours later than intended! I'll be back in the morning with a look at both events at halfway. The first round of the Omega European Masters is still ongoing and the BMW Championship (previewed here) is yet to begin but I thought I'd kick the blog off early as I've already added to my pre-event picks (here) with last week's winner, Matt Wallace. In their wisdom or cruelly (delete as appropriate) the European Tour grouped the three men to miss out on Ryder Cup selection - Matt Wallace, Thomas Pieters and defending champ, Matthew Fitzpatrick - together and I'm not sure any of the three benefitted from it. Fitzpatrick looked particularly grumpy, Pieters fared OK and Wallace said he went through a flat spell halfway through the round. Wallace also spoke about his selection near-miss and I couldn't have been more impressed with his attitude. "I've had a lot of disappointments in my life, in my career playing golf, and I've always used it as fire to get better. This is probably one of the biggest you can have, so watch this space." Wallace, who appeared calm and unemotional, had clearly processed the news brilliantly, going on to say. "I respect his decision, I've looked at the people he's picked and he's gone with experience, which I believe they probably need as well." I backed Wallace in-running at 40/1 after he'd done this at the seventh (his 16th). Having finished the day on two-under-par, it's hard to know how far back he'll be by the time he tees off tomorrow afternoon and he could easily drift from his current price of [34.0] on the exchange but he looks worth getting onside. He may not be anywhere near over the disappointment and he could lose the plot tomorrow but we've seen what he's capable of and he could just as easily race up the leaderboard. And if he does that, he's a dangerous beast in-contention. The BMW Championship doesn't start for a few hours so if you fancy a bet in the First Round Leader market, check out Dave Tindall's thoughts on who might make the early running here.